If you didn't know that there are conifers that shed their foliage every year and grow a full new set in the spring, just like a maple or an elm, don't feel too bad. You're not alone. Perhaps the best known deciduous conifer is the bald cypress (Taxodium distichum.) The larches are also deciduous conifers, known for their clear yellow fall color. That color is one of the features which make them popular for bonsai in areas where conditions are suitable for their growth. Larch, species unknown, two blocks from my house. Some of the foliage is still turning. The cones are smaller than a table grape, too small to show in the picture. There are 10-12 recognized species of larch, depending on the source you consult, as well as a few hybrids; they make up the genus Larix in the family Pinaceae. Besides pines and larches, the Pinaceae family includes spruces, firs, hemlocks, true cedars (Cedrus), and a few other genera. Three species of larch are commonly used for bonsai: Larix decidua, European larch; Larix kaempferi, a.k.a. Larix leptolepis, Japanese larch; and Larix laricina, American larch or tamarack. American larch is native to Canada and parts of the eastern USA. My location in Indiana is just within its native range. It's very adaptable, fairly fast-growing when young, and shrugs off cold like a musk ox. I picked up a pre-bonsai Larix laricina at MABA 2017; my lovely wife bought it for me as an early Christmas present. And it's turning color too. My larch bonsai-in-the-making. 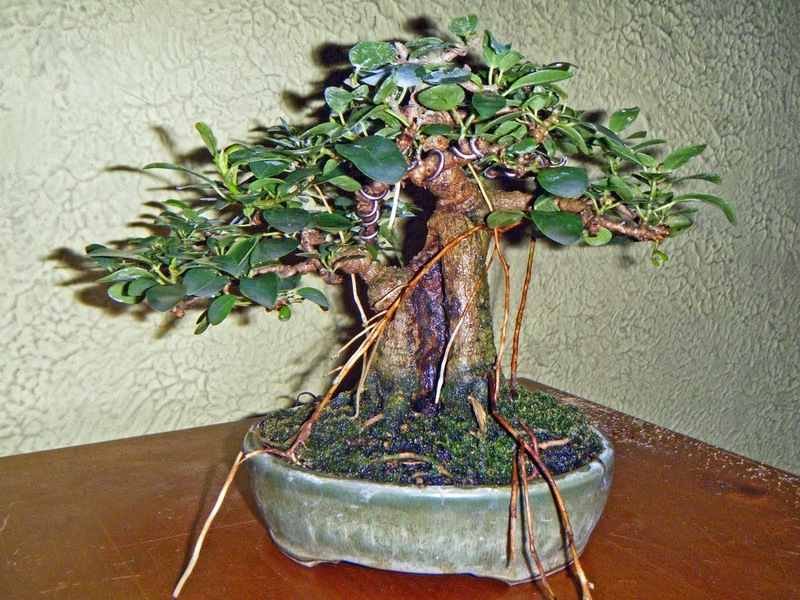 The trunk just above the nebari is a little more than 1 inch in diameter. This is my first real try with a larch, so I've been reading up on its care and am thankful that I live within its native range. Once the needles fall I will finish styling the uppermost branches. I have a Sara Rayner pot that I think will suit it, come next spring. If all goes well, it should be on display within a couple of years. Wish me the best!